Featuring gratis wireless internet throughout the property, Aida Lux is located in Ulcinj, 4 km from Long beach. Some units have an outdoors terrace and/or balcony with sea views. There is a private toilet with a bath or shower and shower in each unit, together with free toiletries. Visitors can enjoy a dish at the on-site dining establishment, followed by a drink at the bar. You can play billiards at the property, and mountain bike rent and automobile hire are available. 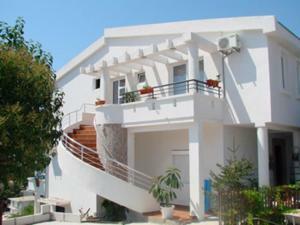 Molla 1 guest house ~0,1 km, Ulcinj price per day from € 40 Molla 1 bed and breakfast. Kitchen info: refrigerator, oven. Apartments Loli and Nero ~0,1 km, Ulcinj Providing a grill and outdoors terrace, Apartments Loli and Nero is set in Ulcinj in the Ulcinj County Region, 4. The accommodation is fitted with a TV with satellite channels. Each unit comes with a private toilet with a bath or shower and a hair dryer. Donji Štoj ( ~ 5.4 km ): 29+ apartments. Utjeha ( ~ 10.2 km ): 49+ apartments. Gornji Štoj ( ~ 12.5 km ): 10+ apartments. Dobra Voda ( ~ 13.9 km ): 40+ apartments, 5+ villas, 5+ hotels. Bar ( ~ 21.7 km ): 151+ apartments. Sutomore ( ~ 27.8 km ): 89+ apartments. Beach Valdanos, Ulcinj ~ 4,9 km from Aida Lux Gravel beach: ideal for families, with caffe bar, equipped with showers. Excellent choice of watersports. Beach Ada Bojana, Ulcinj ~ 12,4 km from Aida Lux Sandy beach: recommended for young people, with caffe bar, equipped with showers. Excellent choice of watersports. Nudism is allowed. Beach Topolica, Bar ~ 22 km from Aida Lux Sandy beach: ideal for families, recommended for young people, with restaurant, with caffe bar, equipped with showers. Excellent choice of watersports. Beach Crvena ~ 24,7 km from Aida Lux Sandy beach: ideal for families. Restaurant Lovac, Ulcinj Guest reviews: 10/10 ~ 2,4 km from Aida Lux Address: Velika Plaza 196, 85360, Ulcinj. Restaurant Antigona, Ulcinj Guest reviews: 9/10 ~ 1,1 km from Aida Lux Address: Old town, 85360, Ulcinj. Cuisine: Seafood. Restaurant Terra Promessa, Ulcinj Guest reviews: 9/10 ~ 0,9 km from Aida Lux Address: Stari Grad Ulcinj, Ulcinj. Cuisine: Italian, Mediterranean, Pizza. Restaurant Dulcinea, Ulcinj Guest reviews: 9/10 ~ 0,9 km from Aida Lux Address: bb Stari Grad, Ulcinj. Cuisine: Mediterranean. Restaurant Castello, Ulcinj Guest reviews: 8/10 ~ 0,5 km from Aida Lux Address: Ulica Ulcinjski Moreplovci, Ulcinj. Cuisine: Seafood.